Battle In APC Over Tinubu’s Plan To Contest For President With Buhari’s SGF? 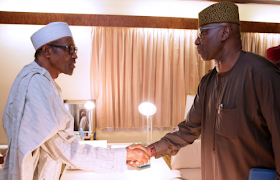 The SGF, SR gathered, is currently battling a intrigues weaved together to end his political career for daring to cross paths with pro-Buhari interest groups within the Adamawa political sphere in order to boost his prospects of becoming Bola Tinubu’s running mate for the 2023 presidential election. Obasanjo, as gathered, agreed to the plan, seeing a sitting Vice President of Adamawa extraction would technically whittle down Atiku Abubakar’s hold on Adamawa politics and probably discourage him from running in 2019. But all that was not to be, Buhari came back hale and hearty. Babachir, like President Buhari, had taunted those who wished his principal dead at different fora. “In fact, some of them wished him dead, but I can assure you that by the grace of God, Buhari will outlive them,” he once said. Now that Bindow is out of the way and the succession contract nullified naturally, Boss Mustapha, cashing in on his value as the most prominent northern Christian politician of APC stock, is aspiring to clinch a running mate ticket in a Bola Ahmed Tinubu presidential project. This explains how and why Buhari’s henchmen have initiated the move to truncate the APC zoning formula. In a move widely seen as testing the waters, Babachir recently came out to say “nothing in the law mandates the ceding of power” to Tinubu’s southwest. Other steps to follow involve drafting the next cabinet with Buba Marwa or any other person, but not Mustapha as the SGF, all to be sure Mustapha is cut to size ahead of time. There is also the plan to reorganize the Adamawa APC structure. Accordingly, all those alleged to have been hand-picked by Bindow and Mustapha in the last congresses would be weeded out. According to SR, with Aisha Buhari, wife of the President, recently adding her voice against the Bindow-Mustapha tango, it is only a matter time before the SGF would be off the stage.